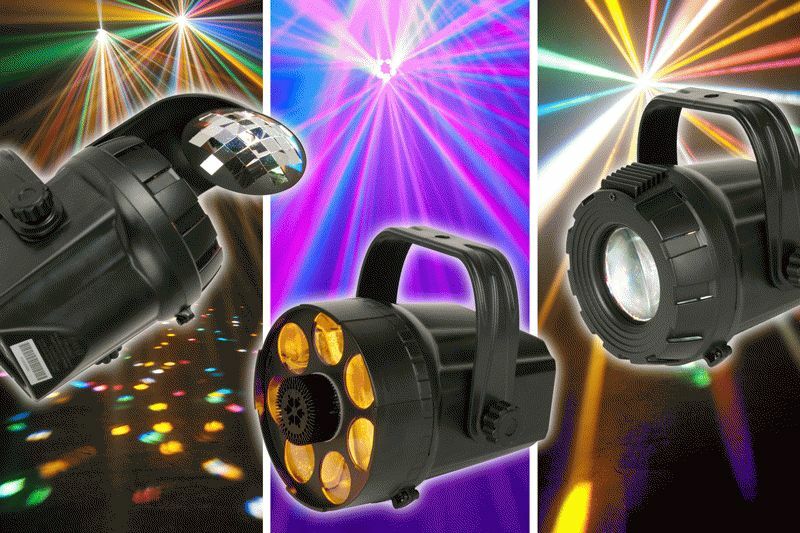 ADJ Products is giving DJs and party hosts the tools to “micro” manage a dazzling multi-fixture light show. The company has introduced the Micro LED Series, a collection of three colorful high-energy LED-powered moonflower-type effects that weigh just 2 pounds (0.7 kg.) each and are less than a foot (304.8mm) in length: the Micro Phase, Micro Burst and Micro Moon. Pint-sized yet powerful, the Micro LED Series effects are ideal for DJs and mobile entertainers who need a smaller rig that’s lightweight and portable, yet still want to create the electrifying impression of a multi-effects light show. The fixtures’ ultra-compact size also makes them great for less-spacious establishments such as neighborhood clubs, karaoke bars, pool halls and bowling centers. And because the Micro Phase, Micro Burst and Micro Moon can be operated simply as plug-n-play units, they allow home users and other non-entertainment pros to join one of today’s hottest trends by spicing up their parties, school dances and special events with colorful LED lighting effects. * Micro Phase – A scaled-down version of ADJ’s popular Tri Phase, this eye-popping 65° beam angle moonflower effect fills a room with 108 razor-sharp multi-colored dichroic beams. It’s powered by a 20,000-hour rated 3-watt 3-in-1 RGB LED. Compact and energy-efficient, it measures 8.5”L x 6.5”W x 5.5”H/ 213 x 165 x 134mm, and consumes just 9.6 watts of electricity at full usage. * Micro Burst – A real party-starter, this festive moonflower projects what looks like hundreds of pieces of multi-colored confetti around the room. It uses a 20,000-hour 3-watt bright white LED as its source, with a maximum energy consumption of 10W. It measures a mere 11.5”L x 6.5”W x 5’5”H/ 286 x 165x 134mm. * Micro Moon – The littlest moonflower of all, the Micro Moon comes in a miniscule 7.75”L x 6.5”W x 5.5”H/ 195 x 165 x 134mm case, and shoots out 28 bright multi-colored dichroic beams, while consuming a maximum of 10W. Extremely easy to operate, all Micro LED Series models feature a built-in microphone for Sound Active operation, propelling their beams to automatically move to the beat of the music. The fixtures also include an FX Knob, giving users the added options of setting the unit in static mode, as well as in clockwise or counterclockwise rotation. Thanks to their LED lamp source, the Micro Phase, Micro Burst and Micro Moon are cool-running effects so they offer the added convenience of being able to run all night without shutting down for duty cycles. The Micro Phase, Micro Burst and Micro Moon each include a hanging bracket and multi-voltage operation: 100-240V, 50/60Hz. As scaled down in price as they are in size, the Micro LED Series effects will fit within virtually any budget. The MSRP of the Micro Phase is $119.95. The MSRP of the Micro Burst is $109.95. The MSRP of the Micro Moon is $99.95.